This is a tender port, you will be tendered to the center of town. The charming west coast town of Pafos focusses around an attractive little harbor whose picturesque open air fish restaurants line a quayside of bright fishing boats and pleasure craft. With a population of just 28.000 Pafos nestles In the lee of the Western Troodos Mountains, which add another dimension to this area of scenic beauty. The recent addition of its own international airport nearby has opened up the Pafos area, and the resort is graced with some luxury hotels along the coastline. Pafos has an air of holiday charm combined with history, and olden-day elegance is lent to the town by its classical style buildings in the upper part of town which leads to the shopping area. The lower part of the town - known as Kato Pafos has a life of its own albeit so close by, down near the sea -home of the harbor, the fish tavernas, souvenir shops and several beautiful hotels with important archaeological sites around them. 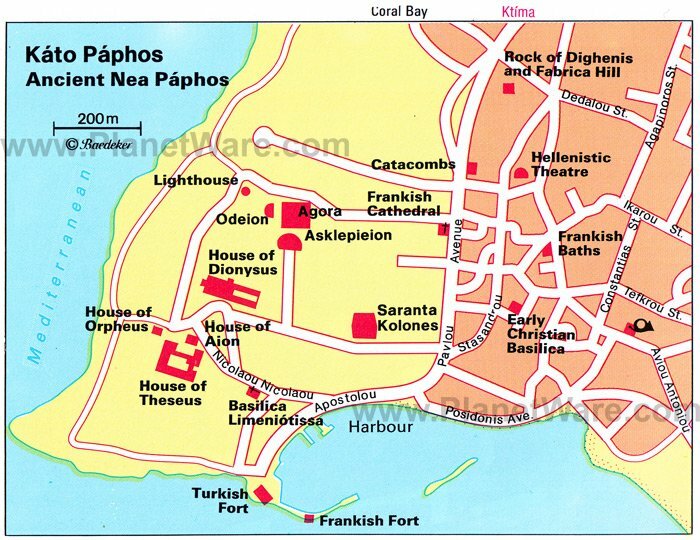 Pafos is entwined with Greek mythology, and the legendary birth of Aphrodite on her shores brought fame and worshippers there to follow the cult of the Goddess. Landmarks associated with Aphrodite are the chunky, rugged rocks of her beautiful birth shore known as the Aphrodite Rocks or "Petra tou Romiou", the evocative sanctuary of Aphrodite at Kouklia Village, one-time shrine and scene of pagan festivals for thousands, the Baths of Aphrodite at Polis, supposed source of fertility and the Fountain of Love, or Fontana Amorosa, a few miles further into the Akamas Peninsula. Ktima is best explored on foot. Most of its major historic buildings and interesting sites, except for the Archaeological Museum, are within walking distance. Shoppers have plenty of stores to browse around in both parts of Paphos Town. There are sparkling jewelry stores selling lovely local products at reasonable prices, handicrafts centers and boutiques selling locally made clothes. The main crafts of the island are offered in the Paphos shops such as, delicately woven Cypriot lace, hand-turned pottery, and paintings and sculptures. These are all among the souvenirs and gifts that travelers often take home because they are well made and the prices are reasonable.